I started reading OMNI when I was about twelve, around 1983. I remember taking the long road trip from Colorado to Missouri to visit family, and the parents allowing us kids to get a magazine. The cover of this OMNI magazine in the rack was compelling and promised SF fiction and science news, so I convinced her to get this somewhat pricey glossy mag for me. I was hooked! I begged for copies every month after until finally I was gifted a subscription. It was probably the longest subscription to a magazine I ever had (mainly because until I was old enough to have a job, it was paid for by someone else) and I think I was getting them right up until about 1989. I don’t really recall OMNI being on shelves much after that. But those formative six years entrenched OMNI as being an integral part of who I am. Yeah, weird, huh? 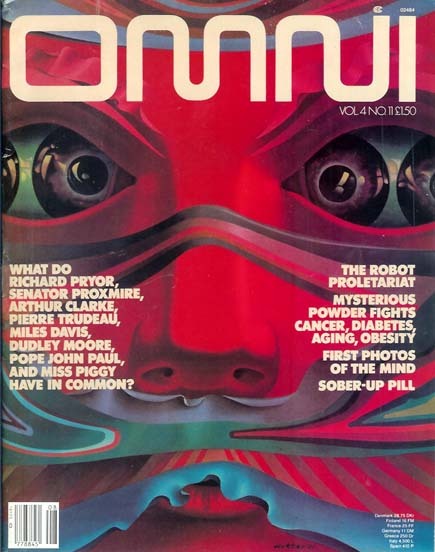 But it’s from OMNI that I learned about William Gibson’s fiction and started me on cyberpunk, made me familiar with the name Ellen Datlow and made a teenager a fan of an editor, of all things. (Wow, I was and am such a nerd!) …and I’m still a huge fan. 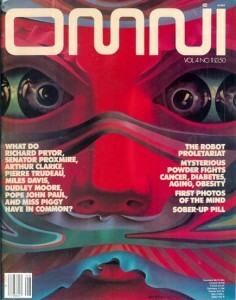 The magazine was a slick, stylish, almost exploitative companion to the SF genre and exploding science culture. I believe it was a forward-thinking contribution, years ahead of its time, to the cool-making of geekness. Back then, in the 80s, it was still a social stigma to be geeky or nerdy, to be too into computers and genre fiction, and know more about the space program than what was mentioned in weekly readers regarding the shuttles. If you read SF and liked Carl Sagan, you were pariah as a kid. But little did we know that in 15 or 20 years, geek would be chic, and OMNI helped lay the groundwork for that! Loving looking through these very familiar past issues that I’d read and reread so many times as a young nerd.